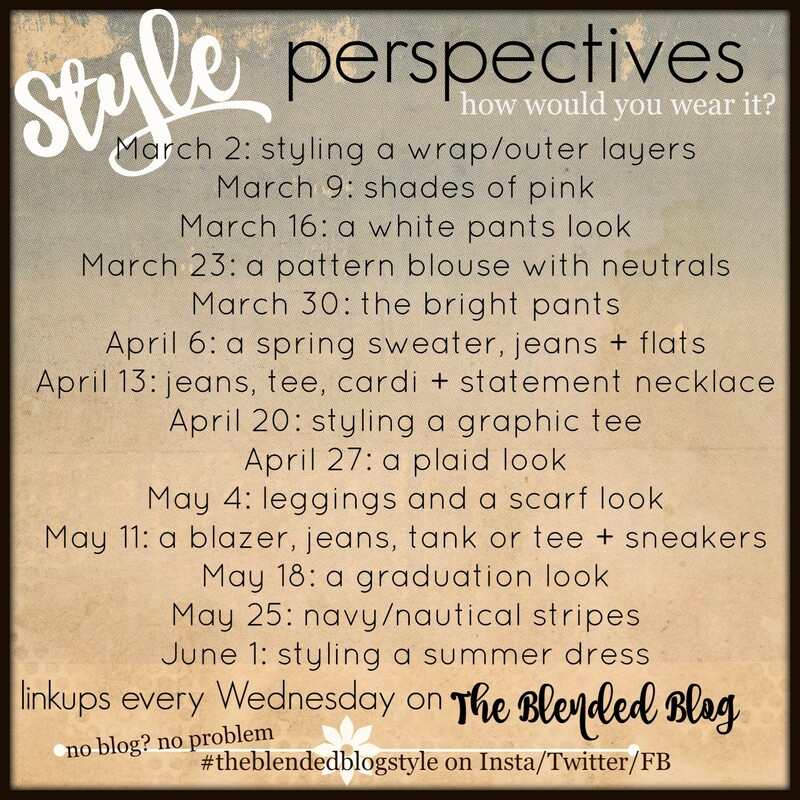 The Blended Blog is hosting a weekly style series on Wednesdays for the next few months. Each of us will take a turn sharing a favorite signature look. Then the rest of us will share our own interpretation of the featured style. We invite you to play along! You can share how you would feature that look on your blog and link up with us each week. Or if you don’t blog, you can share your look on social media with the #theblendedblogstyle and #StylePerspectives hashtags. For our first day, Library Lovin’ Lady (a.k.a Leslie of Once Upon a Time & Happily Ever After) showed us how she styled an outer layer/wrap. It’s been warming up here so I barely need an outer layer. I started the day wearing red jeans and a grey top, but after I saw myself in photographs, I deleted that grey top from my wardrobe. I have another space to fill in my closet when the shopping ban is over! I subbed out the grey top for a grey leopard print cami. I paired it with a grey lightweight waterfall cardigan. I have gotten so much use from this outer layer! It’s so versatile! Since the day was really warming up, I didn’t like the way this looked; it was too dark a look for the beautiful weather. I decided to change to white jeans. I liked this so much better. However, one little sub brought this outfit right into spring. 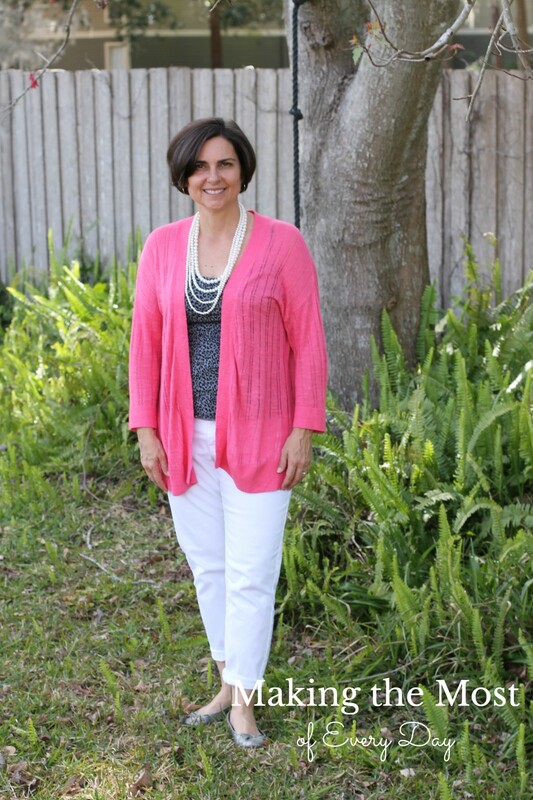 By changing out the grey cardigan for a coral one, the whole look is brighter. Which look did you like better? Do you have a favorite outer layer you like to wear a lot? 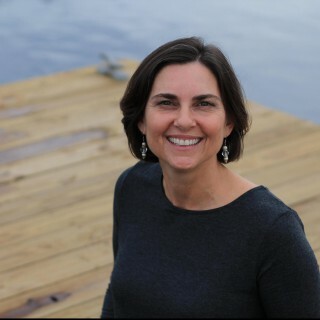 I hope that you’ll join us each week! Check out the other blogger’s take by clicking on their links below. Amazing what one (or three!) little swaps can do for an outfit! I really like the monochromatic look in the first picture AND the brighter springy second look! NICE! I styled a more wintery look and linked up to The Blended Blog! See what you think! I didn’t get your post in my inbox. Strange. I’ll have to look for it! 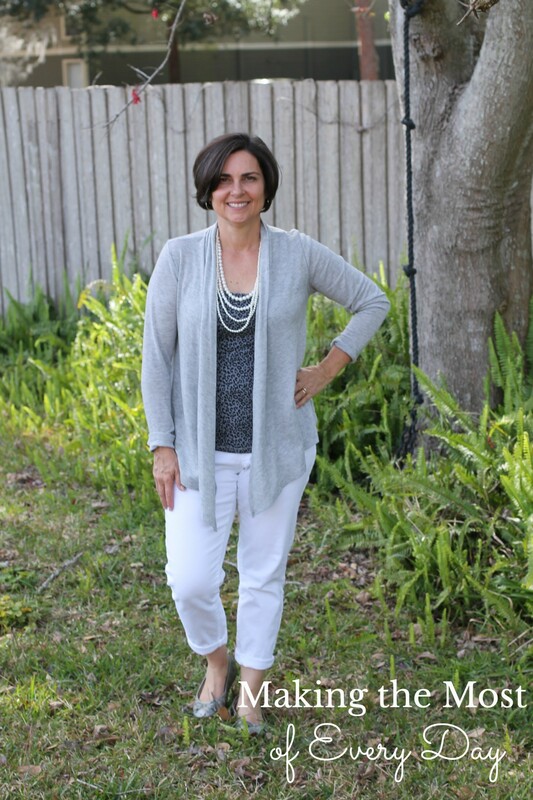 I love both looks and especially your versatile necklace! Gorgeous. Thanks Abbie! It was a steal and I’ve been styling it a lot lately! Love this outfit on you! The leopard print cami is so fun, and that pink color is one of my favorites! It’s such a sherbety color! Very springy! totally love these!! Love how each one changes the outfit so much! Both are great!! It’s a good exercise to take basic pieces and change one thing to see how to construct many outfits. It’s the capsule wardrobe principle. Really nice looks, Sheila. Simple changes created totally different looks. Good call on the sweaters. Thanks to your shopping ban Carrie, I had to try new things with existing pieces. how pretty and sophisticated you look in ALL your looks!!! The pink is perfect for spring! Yes, and it was light enough for a warm day, but still have an outer layer. The outfit changes so much just by swapping out the color of the cardi. Both looks are fantastic. Yes, I loved how different they both looked but the change was so simple and easy. Wowzers, does the outfit ever change when you just switch colours!!! I probably could have kept going with other colors too. Ditto, what my friend Deena said above. Crazy how switching the colors of your cardi changed the whole personality of this outfit. I am on the look out for a pair of pink pumps (a lot Ps) just the shade of your pretty sweater. You wear that color so well, my friend. Now that would be a fun pop of color! Good luck with the hunt! Sheila – I like both your looks. I thought the first look was my favorite – and then, I saw the pink – and it is a tie – the both look great. Haha! That’s great Lisa! Thanks!